There’s a fallacy in thinking there is anything different, unique, or inventive on Powerdrive’s Steel Roots. No, this isn’t even an entirely creative or technical achievement. 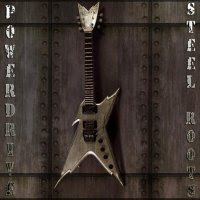 Instead a musical achievement, using the correct amount of American influence, Powerdrive has proven with Steel Roots, that this formula, still works. Steel Roots rather commercial introduction “Final Chapter” is a perfect mix of simplistic, honest and generic idiosyncrasies. All of the tracks are binary in form, and although that could be viewed upon as a minor critical blow, it’s their initial riffing and vocal work, which feel fresh. Yet it’s an underwhelming introduction at best. The guitar riffing at times appears lazy. Ideas show sparseness on Final Chapters song structure because of its intense obviousness, not to mention it falling short on atmosphere. Final Chapter is stuck on boundaries that are far too easily broken, within their target market. However, if you can ignore these tiny imperfections Powerdrive’s (ironically titled) Starting Over gives much more of a kick, as it does flexibility. It’s exhilarating, brutal, powerful and intrinsically addictive. There’s enough material present to keep you on edge, as there is to keep you thwacking your head around in metallic delight. There is considerable depth on Alive, if you’re prepared for reflections similar to 80s ballads. “Alive” yearns for potential, but is squandered by its poor song structure; it also lacks an emotional flame for it to fully alight in. It is listenable, and plausible, but simply not good enough. “Self Determination” reveals Powerdrive’s potential on song writing, with pounding guitar riffing, blistering drumming, and nailed ardent vocal takes. “Treat”, “Laid to Rest”, and “Blast” portrays Powerdrive within their classy comfort zone. Its raw, its rustic and its enthralling. “Silver Bullet” excels on creating atmosphere, and a level of melancholy, which helps it become a memory within Steel Roots. Other times, it exceeds an acceptable level of mature emotion to limbo under the barrier of becoming silly. However, the lead guitar work present on “Silver Bullet”, deserves acclaim, as it helps make up for these periodic disappointments. It’s mesmerising, leaving the desired punch that the type of song requires and although no technical achievement as far as guitar virtuosos go, this is tremendously great sounding frequency. “Dead Silence”, “New Life” and “Untouchable”, serve as an excellent outro for Steel Roots. It’s notably Powerdrive’s most technical work, and when it wants to be, the most irrefutably intense section of the album. It stands out to shine through, and could well be a benchmark for Powerdrive to reach next time around. Its also excellent to hear an unsigned bands work so sonic and polished in its production. This is also a credit to each individual performance, proving an excellent listen to further add resemblance onto the bands talent. Creditable modern stigmas go out the window with Powerdrive, as they teach an old used and abused genre new tricks. Yes, at times Powerdrive will feel like an antithesis on modern metal but that’s probably why you’ll love them. This is an old-school record repaying a genre congested with emission. What next for Powerdrive? Probably a record deal and tour bus to accompany.